Last autumn, a genealogical television show I watch stirred up some controversy. It seems that a celebrity whose ancestors were being traced refused to reveal that he has a slave owner in his lineage. Instead, the actor opted to shut his eyes to his ancestor’s existence, silence the echoes of the past, and revise his family history as he saw fit. As an amateur genealogist, I was appalled. In my humble opinion, every person’s story should be told; and those stories should be as truthful and unbiased as possible. Each of us who has dug deep enough into our family roots has unearthed a skeleton or two or three… It is inevitable. We all have the good, the bad, and the downright “ugly” ancestors. It is what it is. We are a nation of immigrants. Most of us descend from others who came to this land whether by their own volition or against their will. With this in mind, I will be documenting all the known immigrant ancestors for both my family and my spouse’s family. This is tenth installment of this series. 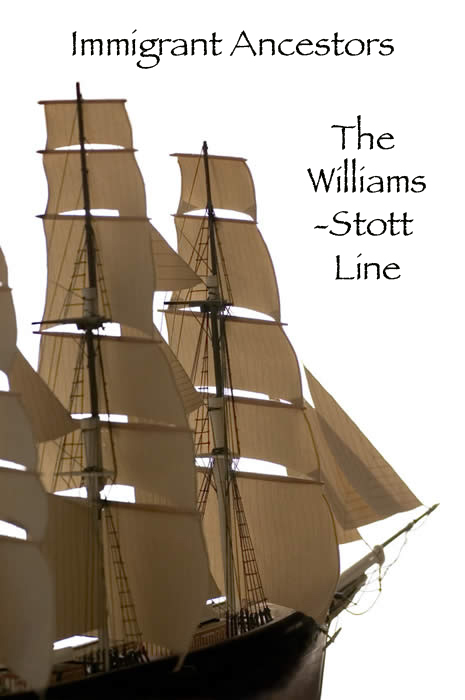 The final installment in the Immigrant Ancestors series chronicles the known immigrants in the Williams-Stott line, my spouse’s maternal mother’s family. We are a nation of immigrants. Most of us descend from others who came to this land whether by their own volition or against their will. With this in mind, I will be documenting all the known immigrant ancestors for both my family and my spouse’s family. This is ninth installment of this series. Six lines down and two to go… Next up in my documentation of our families’ immigrant ancestors is the Harwick-Bush branch of my spouse’s kin.